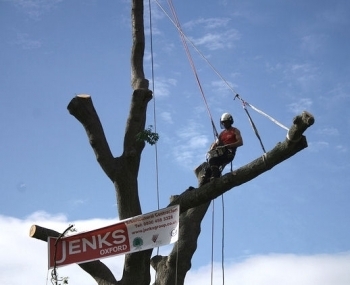 Jenks Group are experts in tree care and advice. We have strong teams of highly qualified and experienced tree surgeons and arboriculturists and we believe in building strong relationships with our clients. We practice an honest pricing policy and we will not recommend unnecessary work. With branches in Oxford and Wokingham we are well placed to deliver services in Berkshire, South Bucks and Oxfordshire. We carry out tree work throughout Oxfordshire, Berks, Bucks and the South East. * Tree planting and emergency tree surgery. We provide expert tree care and advice working in Oxford, Abingdon, Thame, Henley, Banbury, Bicester, Wallingford and Wantage for private, residential, commercial, council and government clients. In fact everything you'd expect from a professional tree surgeon. Jenks Group are experts in our field for tree care and advice. We are a strong team of highly qualified and experienced tree surgeons and arboriculturists and we believe in building long-term relationships with our clients. We practise an honest pricing policy and we will NOT recommend unnecessary work. As well as tree felling, tree removal, tree pruning, tree surveys and stump removal, we offer emergency work, tree planting, advice on diseased and unstable tree and much more. Jenks Oxford covers Oxfordshire and the surrounding counties and Jenks Wokingham covers Berkshire. Both teams are willing to go further afield if necessary. Just call the central office on 0800 4583328 for a free consultation. At Jenks we carry out tree safety assessments, full arboricultural surveys and BS5837:2005 Trees in Relation to Construction reports for planning and construction. We can provide a simple written report containing basic tree details or full arboricultural or tree surveys which are similar but much more in-depth and are typically applied to single trees. All our arboriculturists have professional indemnity insurance to protect tree owners against legal claims resulting from errors in assessment. Please note, however that the insurance will not cover you if you fail to act on recommendations contained in the report.